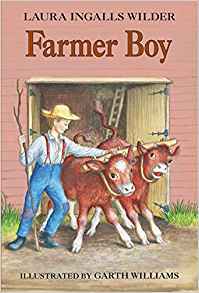 Our latest Cook the Books Club selection was Farmer Boy by Laura Ingalls Wilder, her charming, somewhat bucolic, and idealized novel of early American farm life, as seen through the eyes of a young boy. Mostly biographical, as it was based upon her husband's upbringing in upstate New York. I enjoyed the story, with all of the homegrown vegetables, grains, and meat, the home cooking, preserving of food, weaving, spinning, and their whole life of self reliance and living on and from the land. Even using the straw for hats, leather for shoes, etc. Talk about going back to the land. We have come so far from that sort of life. Refreshing to read about. Even the "bad boys" at school get their comeuppance. This is definitely not a dysfunctional family. Though of course we know there were lots of those at that time as well as in our own. She spared her young readers, many of whom likely wished themselves on the little house planet.